Concluding post in a nine post series. 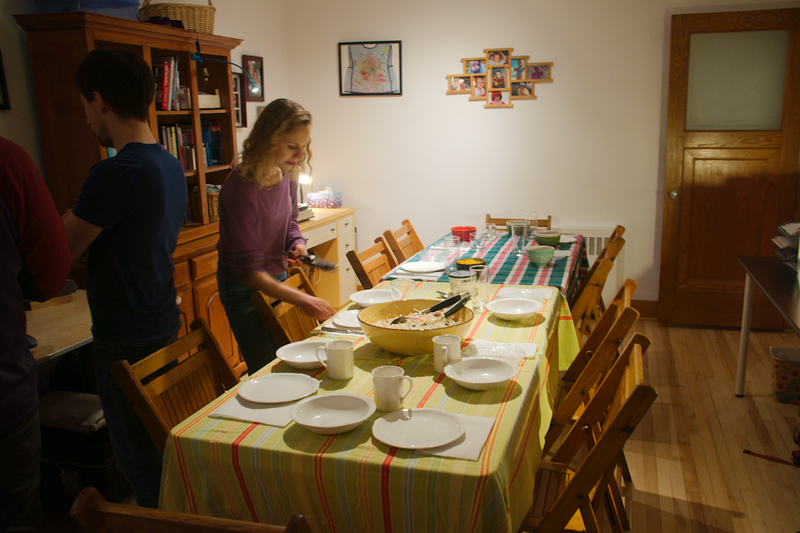 Hospitality and shared meals are important values in our home. And yet there is everything I just wrote in this series, all the hung-ups and issues, identity struggles around food and cooking, the differing ways of eating within a single family unit, never mind culture. How is one to navigate this? With a few house rules and a generous serving of grace. Cook to the lowest common denominator, or in other words: make sure those people with food sensitivities, allergies, or philosophical/ethical positions will have something to eat at our table. It might only be one thing but it needs to be substantial. Everyone might not be able to eat everything but they will not go away hungry. (Unless they are a teenage boy with the bottomless pit for a stomach, in which case, more bread.) And in the case of potluck hospitality, which is our favorite kind, it's helpful to remember that people can always bring the food they want to eat to a gathering. Serve people the food we are eating and preparing. I grew up in a gourmet household with much joy and deliberation spent on meal plans and preparations. This can't be my standard. When people come for supper they get the food we usually eat, which is mostly one-pot meals. A spread with multi-dish components is a rare occasion and usually reserved for celebration meals. And I have to give myself plenty of time to prepare such a meal because it's not second nature to me. 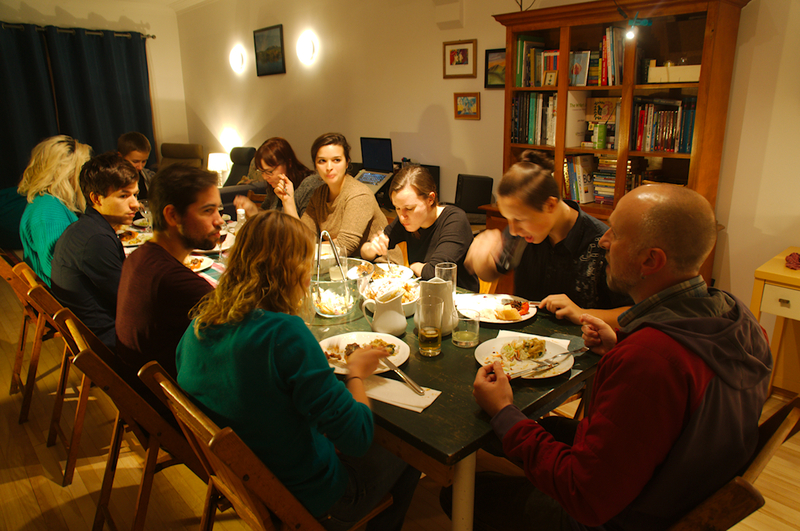 If people will be around at a mealtime, and it's within our power to do so, we invite them to eat with us. Knowing that they'll get what they get, which might not meet our first rule if we don't have enough time to accommodate or adjust plans. In which case, they don't have to accept our offer but at least we offered. Share the responsibility. This is the only way hospitality is really sustainable for me. Potlucks are my default. So is assigning my kids cooking and cleaning tasks. (It's a given that Damien helps on some level.) Only on very rare occasions do I do everything myself. Grace, in life and in cooking, covers all the rest and especially the gaps in-between our ideal selves and our real selves. Or in this case, our ideal meals and ideal hospitality and our reality. knowing that everything we make won't be everyone's favorite, and that's ok.
knowing I'm not responsible for people's happiness around food or anything else in life. appreciating the gift of other people's cooking talents in my life and learning to be ok with my own lack of interest right now in that area. And of course Grace, a prayer, is giving thanks for the source of our food - the plants, animals, and the life energy itself (God, Spirit, Divine, the Sun, so many things to thank!) that is sustaining us; the people who's labor brought this food to our table (think of all the people involved in getting food to our table! ); the people with whom we share our meals. What a gift and opportunity to stop and recognize all of this before we eat. And at this point it all becomes rather simple. Not so complicated after all. I have to share one quick story here, something that happened shortly after we moved to Montreal and had just joined our homeschool community. One of the families in the co-op was going through a crisis and the other families of our group were supplying suppers for the family. That was the summer I stopped my mostly-plant based diet and just threw my hands up in the air around cooking all together. I was getting meals on the table but I didn't want to think about it anymore. I was finding my groove in a new city, in a new community and I didn't know this family at all. And when the call for food was given, it was all I could muster to buy a couple frozen lasagnas from the local grocery store. I figured something was better than nothing. It turns out the mother of this particular family was the cooking teacher at co-op, the caterer for our theatre productions, and the matriarch of an Italian-Greek family. In other words, an accomplished cook and basically all around chef-extraordinaire. It's like giving a store-bought lasagna to Ina Garten. Later when I found out this woman's cooking skill and status I felt shame about what I had given. Thankfully, there was no returning of casserole dishes necessary with a store-bought lasagna so I never had to make eye contact around this embarrassing experience. Since getting to know this family I have never known them to eat the kind of food I gave them. For all I know that lasagna is still in their freezer. I wish I could say I've since come up with a fail-safe, meal-for-a-family-in-need signature recipe. But nope. I'm still just bumbling my way through it. After everything I've written in this series, all the angst and struggle and questions that remain unanswered, eating together with the people I love is one of the highlights of my day, however it happens. Probably because I know these years are fleeting and precious. I did not have the same appreciation for supper-time especially, when my kids were younger, that's for sure. Supper and the pre-supper witching hour was a time you endured, not savored. But those days are already long past. At this stage with teens about to take flight and days spent doing our own things and children's lives becoming increasingly private and individualized I love eating with my people. And I love coming to the table at six pm to a meal prepared by one of these people, people I taught to cook, even through all my feeling of inadequacy and identity struggles around food and diet. At some point you realize it's really not about the food, as much as it is about the food. Food matters, absolutely. I don't want to prepare or serve food that people are not able to eat either physically or philosophically. And of course I want people to be happy at my table, but that is as much about the spirit of the gathering as it is about the food you eat. I still struggle with all this. I can get angsty about having people over and hosting meals. I feel the complication of food both cognitively and relationally. I don't even know exactly how I should eat, what I should trust, adding more people to the mix just amplifies the questions. This is not something I'm going to figure out anytime soon, and yet I have to keep eating and cooking. And I like eating. And I like eating with other people especially and so I'll live with the tensions and questions. Maybe someday I'll re-consider my diet and follow a plan, again, of some sort. But regardless I'll keep feeding those I love (and those I'm just meeting or getting to know) to the best of my ability and interest - which might be rotisserie chicken from the grocery store, easy but expensive salmon sheet-pan supper for special occasions, a simple vegetable and bean curry with steamy rice, or homemade vegan lasagna that took all afternoon to prepare. And I'll accept (and require from my own people) help in the kitchen. And with it all, over and through it all, I'll serve heaps of grace, as much for myself as others. Francie on Sept. 6, 2018, 3:13 p.m. Excellent series, Renee. Thank you. Before having children, my partner and I devoted a lot of time to cooking together and it was a very enjoyable part of our lives. Now with two young children, I am definitely in survival mode when it comes to putting meals on the table. I consider myself a decent cook and a good mother, but it turns out that I have very little patience for "cooking while parenting". We are still focused on good ingredients and nutritionally balanced meals, but these days I will always default to the fastest and simplest thing possible within those parameters, even if it gets repetitive. Interestingly, I am extra patient when it comes to supervising my kids' frequent cooking experiments and am not particularly flustered by the burned buns or the broken eggs on the floor or the "kiwi with mustard surprise breakfasts," so I am confident that the day will come when we will all have the time and skills necessary to produce and enjoy much more interesting and varied meals together. In the meantime, here's to a helping of grace and to putting people first! Susan on Sept. 6, 2018, 4:37 p.m.
Renee on Sept. 6, 2018, 4:41 p.m. 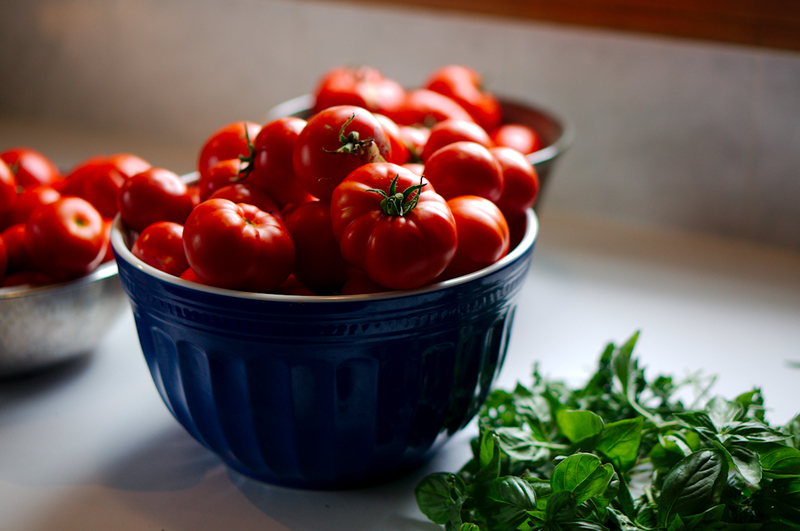 Thanks Susan for sharing your experience and this recipe. That looks really yummy! Pam on Sept. 7, 2018, 2:14 p.m.
We were once a family in crisis, and people brought us food. I don’t remember a single thing people brought. I remember they cared enough to bring something. jen liminalluminous on Sept. 7, 2018, 2:18 p.m.
Nope, I don't like eating wth people. I don't value eating, I hate eating with people, even close friends....I don't really care about eating with my husband. I HATE HATE HATE HATE HATE eating with people I don't know very well. Oh dear. Food hang ups aplenty. But maybe this is at the root of my concerns with hospitality??? I just don't care about food and eating with others induces anxiety!? Renee on Sept. 7, 2018, 2:21 p.m.
Kim Gross on Sept. 7, 2018, 7:22 p.m. Your honesty is so refreshing. This entire series felt so close to me even though I have never tried eating a plant based diet. My entire family is gluten free. My kids moved to Florida leaving me an empty nester. I've had all of these feelings. However, I used to identify myself as a great cook. Now, I have to qualify that I make tasty gluten free meals because lets face it … often other folks don't think gluten free is great. Oh well, I do the best I can and I enjoy it. I will say that my favorite go-to meal for families in need is pork tenderloin. It's a snap to throw in the oven with salt and pepper. Add a carton of Bob Evans mashed potatoes and a salad. Sometimes I add rolls. Dinner is delicious and done quickly with very little effort. It hasn't led me down the wrong path yet! Selina on Sept. 8, 2018, 12:37 a.m.
Brett Ann Stanciu on Sept. 17, 2018, 2:49 p.m.
That's a table I'd be happy to sit at!